I needed some 2x4s to throw up some cheap utility shelving in my storage room. I don't normally buy framing lumber, but in my memory a 2x4 is an incredibly cheap piece of wood, running about two bucks and change for an 8 footer. I especially can't believe that last one: $7 for a 2x4!?! So what's the deal here? Am I just a cheap skate with a hazy memory? Or has the price of a 2x4 gone way up? The price seems to have gone up drastically on all wood products, I went looking for some 2x4's and cheap plywood for shop shelving, the 2x4's were $4.00 and for plywood the cheapest they had was fir sanded 1 side $47 the other side had big knot holes and cracks in the veneer. It's crazy but it is a commodity and prices can change really quickly. I gave up years ago when it came to building down and dirty shelving, Now I buy 3/4 inch construction grade plywood and rip it into strips. Easier to work with in the long run and you get a better looking shelf to boot. 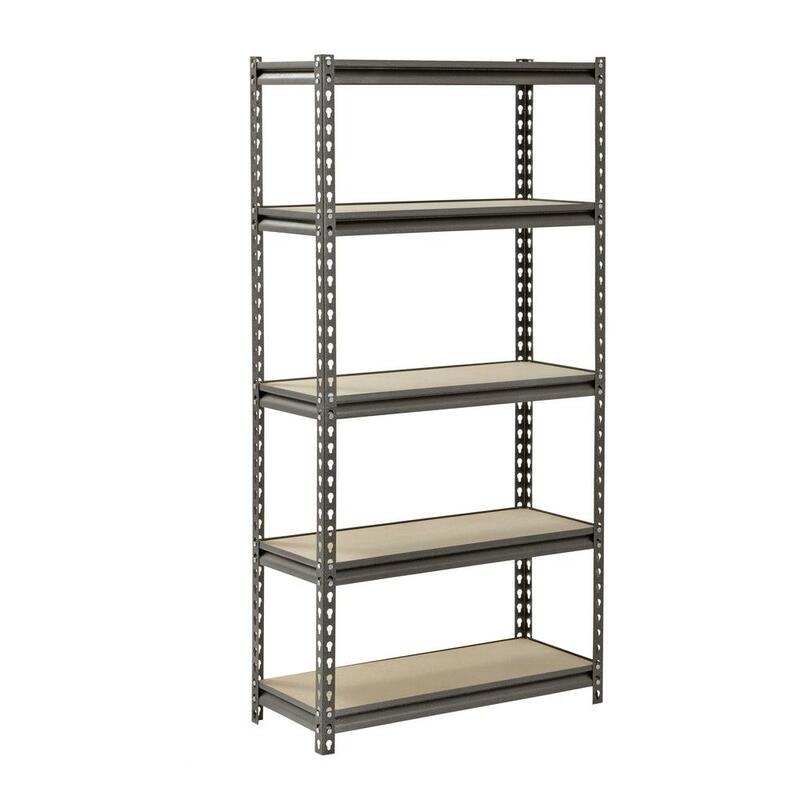 For the cost, time and effort to make your own shelf, I would just buy metal shelving like the below. $38 and done. Bob, Home Depot in Canada sells different stuff than you can get. Closest equivalent here is about $120 (Canadian). I wouldn't mind spending that if they were straight and had all there edges I just bought a bunch (not Econo) and it's crap. Crappy Tire sells an identical shelf, I have a number of them. Their normal retail price is about $90, but they were on sale last week for $60 (and earlier this year for $45! ), and I picked up a couple for the other side of the same storage room, for a different purpose. I think I have about 15 of them in total. My storage needs on this side of the room, however, are quite particular. If I bought those shelves, I would have to buy 5 of them ($300 plus tax at the sale price) and from experience it's about 15 minutes each to put them together, so about 1.25 hours. And for all that work and money, they won't quite suit my needs on that side. Even at these crazy 2x4 prices, my design has me spending only $75, and I am pretty sure it will only take me about 2 hours to throw together. So for an extra 45 min of work - 1 hour tops - I'll save atleast 60% and get something that works better for my needs. Plus, remember what I said in the OP: I'm a cheapskate! Last edited by callee; 02-11-2019, 12:34 PM. Oh, you're telling me. The few times I've had to buy framing lumber at the BORG, I've had to go through the pile looking for straight ones. I'd say I probably find about 1 good one for every 5 or 6 I look at. Good thing the employees there don't object to you picking through, but I pity the guy who shows up when we've gotten to the bottom of the pile! Ok, back from BORG. I decided to grab 22 2x4. I went through the pile and kept track of how many I rejected to get a decent pile: 13. I wonder how much 2x3 is/was? The price was even higher last summer, around $4.50 at the borg. I was buying some 2x6 for my reno and the price went up $0.70 over night. It was cheaper to rip in 1/2 the 2x6 then to buy 2X3 and no finger joints! Beaverfever1988 and ShoestringMariner like this. They are unavailable here in our store Jim so I can't get a price here but I was wondering about their price in Ontario. I always rip 2x6 or even 2x8, 2x10 etc. like Mark suggests. I prefer doing that except for the labour because the quality of the lumber in a 2x4 or 2x3 is much better in the wider boards. That's actually a better option for anyone who is setup to do ripping easily and doesn't mind the labour. 7$ for a 2x4??? That's insane. I pay that for a White cedar 2x4. I hope my supplier doesn't check those prices. What do you pay for a spruce 2x4? Your guy might be selling old stock which was not as valuable in the first place. It is a commodity and pricing is controlled unless used by a lumber yard as a lost leader for example.